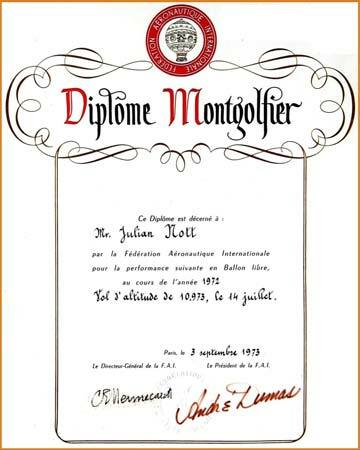 Nott has been awarded the highest award in the world specifically for ballooning, THE MONTGOLFIER DIPLOMA of the Fédération Aéronautique Internationale, FAI, also known as The World Air Sports Federation. The FAI is recognized by the International Olympic Committee and universally accepted worldwide as the international body controlling and regulating sporting aviation, see www.FAI.org. It controls all aviation world championships and many major international championships. It regulates, monitors and recognizes all world aviation records from those for model airplanes through parachuting, ballooning of course through to supersonic fighters, airliners and spacecraft. 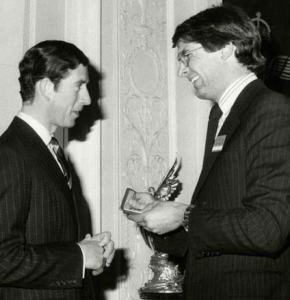 The Royal Aero Club, current Patron The Queen and current President Prince Andrew is the body controlling sporting aviation in the United Kingdom. The Club’s awards, particularly The Gold Medal, are given both nationally and internationally. Nott has received all major awards of the Club which are appropriate to his work. 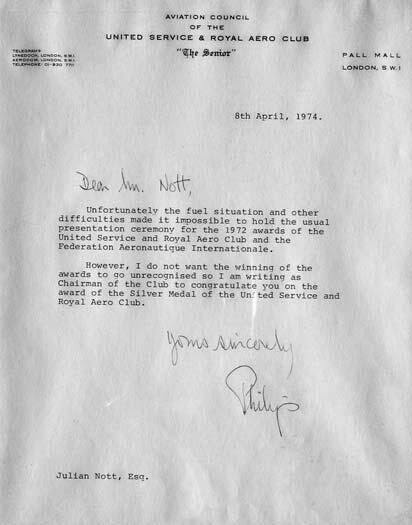 It may be argued whether the Royal Aero Club’s Gold Medal or its Britannia Trophy is the most important award. The Gold Medal is awarded internationally. In any case Nott has received both. 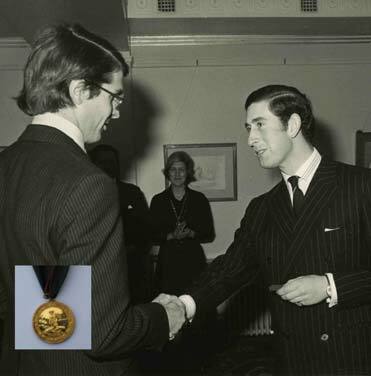 At left he is receiving the Gold Medal [inset] from Prince Charles. “The gold … medal [is] awarded annually for outstanding achievement in aviation during the preceding year or over a number of years…”. At the time of Nott’s awards the medal had been given to only thirty five individual worldwide since the Club began in 1901. 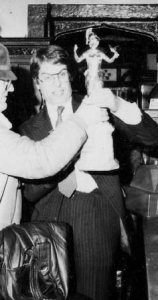 At that time he was the only person to have received it for ballooning. Prior winners included The Wright Brothers, Charles Rolls, founder of Rolls Royce and Armstrong, Aldrin and Collins of Apollo 11. 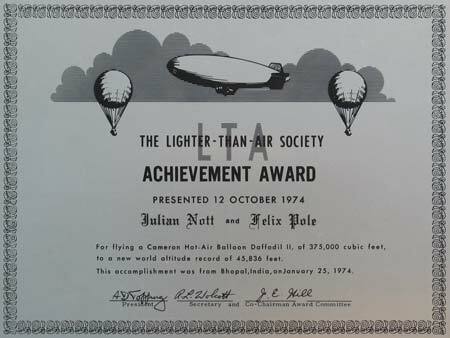 LEFT Nott was awarded the Lighter than Air Society Achievement Award, the Society’s leading award. At the time Nott received it, the Society was supported financially by the Goodyear Company and was arguably the most important association interested in and promoting airship in the United States and the world. The famous World War II aircraft carrier, USS Intrepid, is now a major Air, Sea and Space Museum in New York Harbor. Exhibits include such famous aircraft as the SR71 reconnaissance aircraft, the fastest aircraft ever built, the Concorde and numerous famous fighter aircraft. The Intrepid is officially designated a National Historic Landmark. 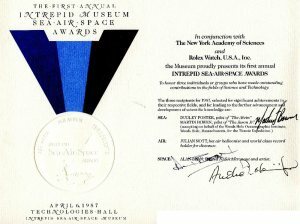 Nott received the Air section of the Museum’s Sea-Air-Space award. At right is part of the official program for the awards presentation. Note that the Space Award went to NASA Astronaut Alan Bean, who walked on the Moon and subsequently became a famous artist and the Sea Award went to Dudley Foster and Martin Bowen for the discovery of the Titanic. 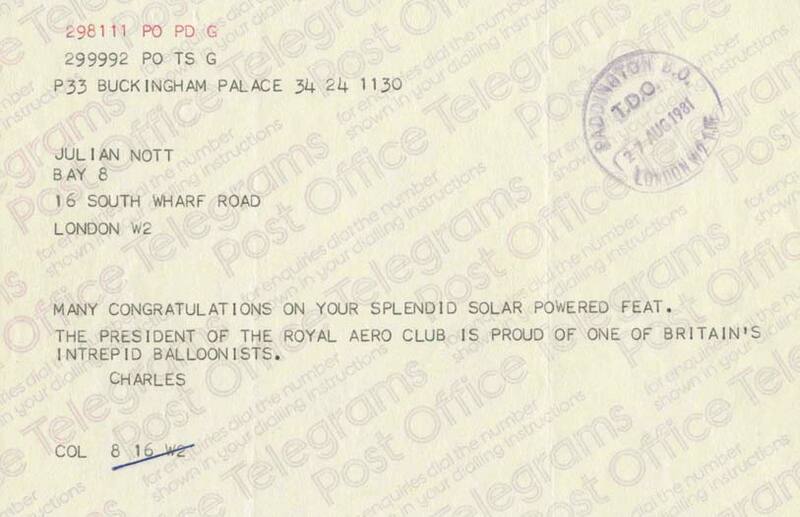 In an unusual distinction, Prince Charles sent a personal telegram to Julian Nott, after Nott crossed the English Channel in a solar powered balloon, see the Popular Mechanics cover included.